This little puffball-on-a-stick is usually found in sandy soil; it favors arid, semi-desert ecosystems in the Great Plains region and western North America. It features a mouth that is not tubular, a membranous outer skin (which quickly sloughs away), and spores that appear smooth under the microscope (unless the microscope is an electron microscope, in which case the spores appear finely warted). Tulostoma poculatum is very similar to Tulostoma lloydii, which is found in woods and waste places east of the Great Plains. I am applying the name Tulostoma poculatum V. S. White to the North American species described above, rather than Tulostoma pulchellum Sacc. as suggested by Wright (1987), who reduced White's North American species to synonymy with Saccardo's Australian species. 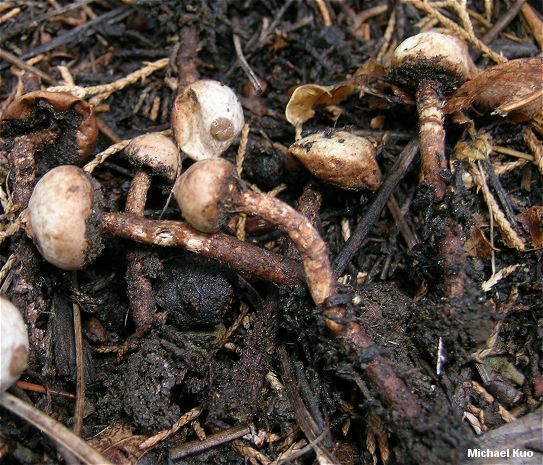 Ecology: Presumably saprobic; growing alone, scattered, or gregariously in sandy soil, usually in semi-desert ecosystems (often in association with junipers or mesquite); summer and fall; western North America and the Great Plains region. Spore Case: 1-2 cm across; more or less round, with a flattened bottom when mature; outer skin roughened and dark, quickly sloughing away to reveal the paler, paper-like inner skin; underside socket-like and flattened, often covered with sand; developing a more or less apical, finely hairy opening that is initially surrounded by a somewhat raised area. Spore Mass: Cinnamon brown and powdery with maturity. 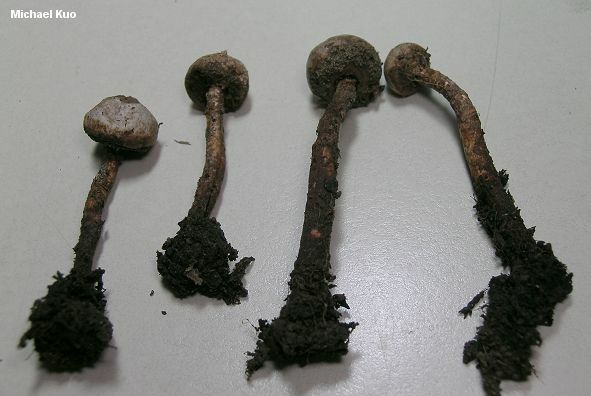 Stem: 1-4 cm long and 2-6 mm thick; tough; finely lined; whitish at first, becoming brownish; more or less equal above a slightly swollen base. 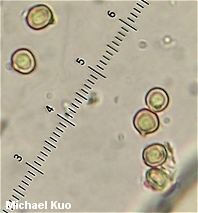 Microscopic Features: Spores 4-6 µ; subglobose to broadly elliptical; smooth or very finely verrucose (usually not visible without SEM); ochraceous in KOH; often with a prominent apiculus. 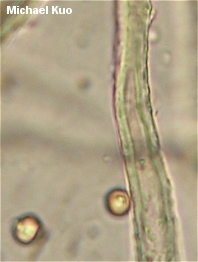 Capillitial threads hyaline to ochraceous in KOH; 4-7 µ wide; walls thickened. REFERENCES: V. S. White, 1901. (Saccardo, 1905; Coker & Couch, 1928/1974; Long, 1946; Wright, 1987; States, 1990.) Herb. Kuo 08051004.